Congratulations to the winners in Ragan’s 2016 Nonprofit PR Awards! You’ve seen the list of the finalists. Now we present the list: The best work done in nonprofit PR in 2016. The entries came in from the agencies that represent nonprofits and from individual PR specialists. We thank every entrant. 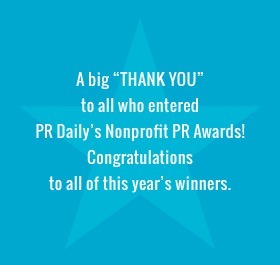 Once again you’ve shown why Ragan Nonprofit Awards contestants lead the way in nonprofit PR and marketing. You make this awards program a success. You make a huge difference in the lives of so many! Please join us in congratulating all of the winners and honorable mentions! Be sure to read about their winning work in this announcement. And now…the winners of the 2016 Nonprofit PR Awards! Love Your Lawyer Day Worldwide Awareness and Celebration, Nader Anise Lawyer Marketing, Inc.
Corporate Website, Crescendo Interactive, Inc.